Get Rid of the Bushel! Why should we be surprised when the highest court in the land declares as a constitutional right that which God’s Word calls an abomination? When a nation has abandoned the law-word of God as the standard for righteousness and justice, we can expect judgment from our Creator. By turning a people over to their own lusts, they end up bringing God’s wrath upon themselves. Some will take this to mean they should go out and protest somewhere; others will begin a petition drive; still others will bunker down preparing for persecution; and others will consider moving to another country. I am not dismissing these actions as legitimate possibilities. But our problem has more to do with the fact that the Christian presence in America for a very long time has failed to put forth the Crown Rights of Jesus Christ. So, let’s get back to basics. Instead of fearing what the likes of sinful man can, does, or will do, we need to focus on what we have been called to do. We have been called to disciple the nations. This means that we are commanded to bring every aspect of life and living under the dominion of God’s Word and teach others to do likewise. Our immediate families, our neighborhoods, our church communities, our places of learning, and our places of business, to name a few, are our areas of operation. 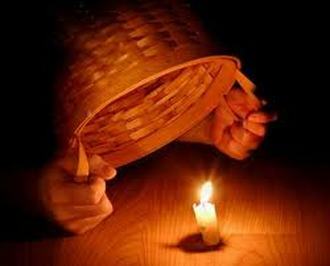 As we are salt and light in these spheres, and acknowledge that our actions are deliberately derived from obeying the Bible, we are letting our light shine (Matt. 5:16). We can no longer hope that people will figure out that we are Christians. We must demonstrate what sets us apart from the rest of the culture, and we must do so unashamedly so that the non-believer can properly identify what it is about us that is pleasing (or displeasing as the case may be). It is time for us to remove the bushel and proclaim the crown rights of the King of kings and Lord of lords. Might we encounter opposition, persecution, discrimination and the like? Jesus told us to expect that. Did we really think that He was just making that up? Remember the word that I said to you: ‘A servant is not greater than his master.’ If they persecuted me, they will also persecute you. If they kept my word, they will also keep yours (John 15:20). Nevertheless, Jesus has also declared that the victory has been won. Look at the proclamations of the wicked as evidence that they are desperately seeking to dominate. They cannot win by persuasion, so they must try to conquer by despotic declarations. But it is our side that wins. The enemies of God sometimes recognize that reality more so than those who have a shallow profession of faith in Christ — those without the wisdom and understanding that come from making the faith a faith for all of life. No, this is not the time to hide under a bushel. Now is the time to declare inwardly and outwardly, “As for me and my house, we will serve the Lord” (Josh 24:15). ← Education: Privilege or Right?